Whoever introduced the notion that life was meant to be experienced in moderation was full of it. Don’t believe us? 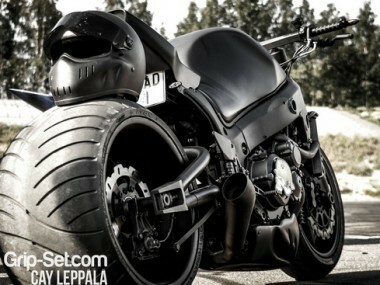 Have a look at this ‘Busa. This bad dog was built to roll heads, burn tires and drop jaws. Any questions? Take it up with the taillight, because that’s all you’ll see of this force-fed monster if you come a’knocking. 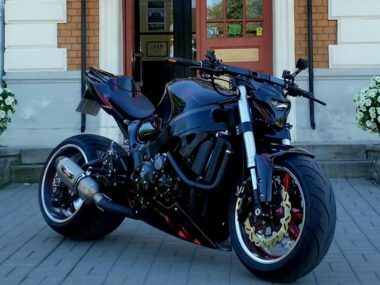 “It’s a complete package, that’s for sure, with custom paint, an outside drive stretched swingarm, a turbo kit and plenty of other top-shelf parts,” said Robert Fisher of Roaring Toyz. While the bike could be considered fat-tire perfection, it took a community of gearheads to create it. 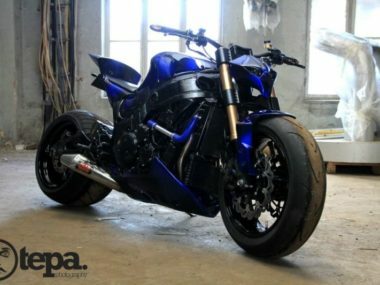 The first go at building this bike back in 2009 saw a 10-over jackshaft 330 swingarm with Performance Machine wheels and plenty of chrome against the stock paint. Not one to let a big wheel slow his roll, the original owner added low compression turbo pistons in preparation for big boost. And that boost came in the form of a modified Stage 1 Velocity Racing turbo kit that produces a claimed 300 HP at 16 PSI with a small shot of nitrous injected into the plenum to cool the charge. But big power is nothing without control, so an air shifter and an array of gauges joined the roster. 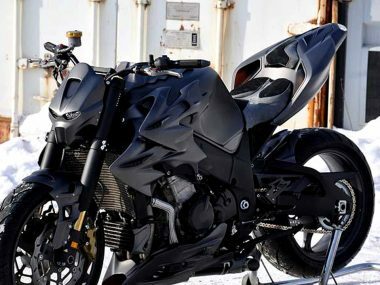 Unlike a naturally aspirated bike with coolant temps, speed and RPM, this turbo bike sports air/fuel ratio, boost, air-shifter pressure and N2O bottle pressure gauges to ensure all is well while spooling. 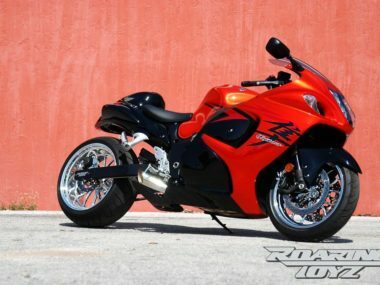 After several years of enjoyment, the previous owner, a soldier, decided to sell the ’Busa to fund another project. At the very same time a friend and fellow soldier named Lorenzo Evans was also in search of a custom crusher. The only catch: He was stuck on tour in Afghanistan. 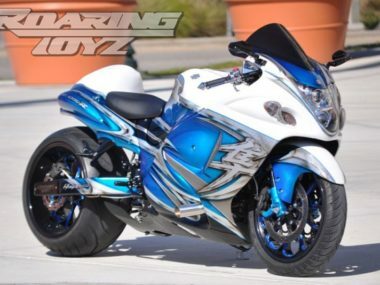 Roaring Toyz drove to Evans’ house and trailered the ’Busa back to HQ, and then the bike was put on the lift. “He gave us a good idea of what he wanted. And after several conversations over the phone and many e-mails, we decided on a new direction,” Fisher said. The power-sapping jackshaft 330 left the building, as did the PM wheels and the stock paint. In their place a Roaring Toyz O.S.D. 300 landed on the bike along with Forge-Tec Ruckus wheels and tons of custom paint. The blue hue was the point of focus, but it’s contrasted by other shades of blue, plenty of white, a dose of black and enough metalflake to make a bass boat proud. Even the swingarm and wheels are layered with paint. As if an O.S.D. swingarm, wheel and paint upgrades weren’t enough, Evans demanded more. 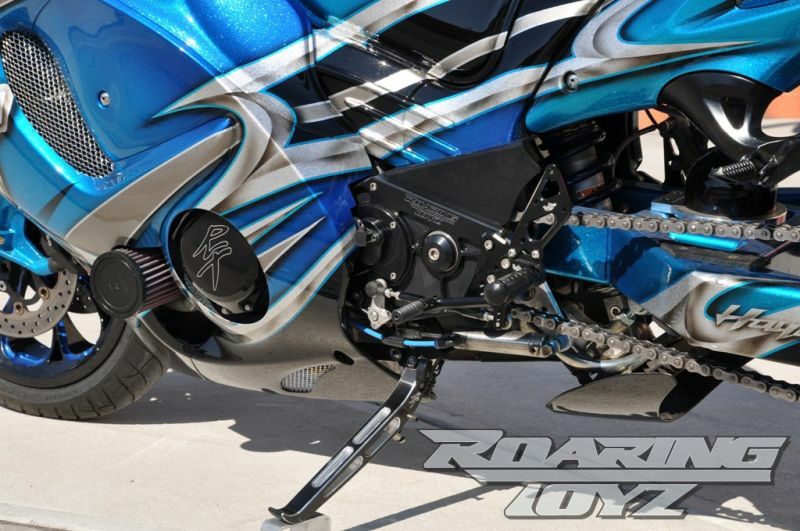 So Roaring Toyz added a slew of in-house accessories: VooDoo billet rearsets, a custom rear shock and an LED/strobe package. Evans had Lightwerkz modify the OEM headlight to accept another projector beam headlight too. And instead of simple halogen bulbs, both projectors received HID kits for plenty of ice-white light. 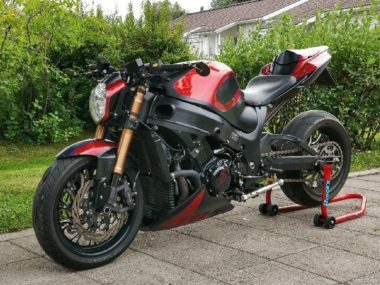 After an extensive overhaul, the Roaring Toyz crew crated up the newly built bike and returned it back to Evans’ garage where it will safely wait until his return. We, for one, are excited to hear about Evans’ reaction upon finally seeing it in person. Hats off to a collaborative effort that turned out a custom with jaw-dropping universal appeal.